‘Where were you last Saturday the 14th of October? 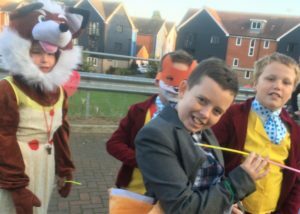 Did you notice a Fantastic family of Foxes? 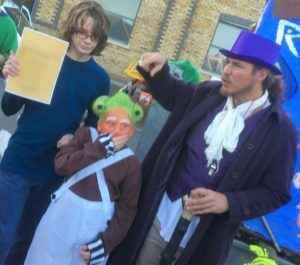 Or maybe Mr Willy Wonka and Charlie Bucket? An Oompa Loompa perhaps? 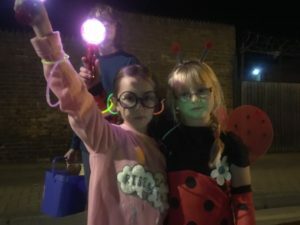 If you were in Faversham you surely couldn’t have missed the town’s wonderful carnival as it snaked its way through the evening darkness. 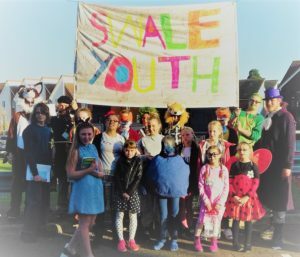 Our BrogdaleCIC Youth team had their very own float, representing Swale Youth, and some of our Monday youth club members were joined by others from Wednesday night’s Youthy Youth. Did you guess the theme from the photos? Yep, the splendid books of Mr Roald Dahl. It was thanks to everyone’s amazing efforts this year that BrogdaleCIC are pleased to say that we were presented with three certificates. Well done to everybody.